Facebook followers of The American Legion are encouraged to head to an enhanced American Legion National Headquarters page and click “Like.” The page now features news from National Headquarters regarding Legion programs, promotions and the organization’s daily activities. The page also contains direct links to the Legion’s other Facebook pages, including the national convention and American Legion Riders. 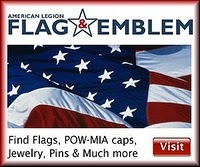 For all of your Legion news needs, please continue to visit The American Legion Online Update page. From this point forward, the Online Update page strictly will serve as a news source for stories about or relating to The American Legion, as well as items relating to veterans, national security employment and health care.